Yesterday morning arrived and with it, the first frost of the season. It was a light frost on the windshield of my truck, but it was definitely frost. The presence of the first frost of the season changes so many things. It is a visible sign that autumn is slipping into winter and the fast approach of the season of darkness. The leaves dropping from the trees surrounding my yard created a blanket on the ground. Another sign of the passing season. 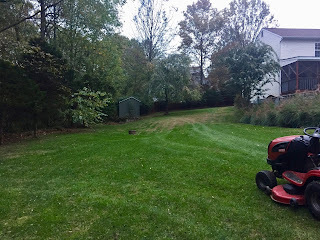 I attacked them with my tractor yesterday and for a short while the yard was free of leaves--but the bare branches of the trees are clearly visible in the image I took of the probable last mowing of the year. I will likely use the mower to blow the leaves back into the forest as they continue to fall from the trees, but I doubt that the grass will grow much more. In honor of the season, I researched the poem by James Whitcomb Riley titled, When the Frost is on the Punkin. I had forgotten that it is written in the colloquial dialect of late-19th century Indiana, which makes it a very interesting read. When I reread poems like this one, I realize that in some respects our language has become too homogenized and that we are losing our regional character. But, the frost is on the pumpkin and the day is getting gone.